It’s that time of year. Just when you think bitterness, brutality, and violence have won the day, Christmas is here to remind you that there’s still a whole lot of good in the world. 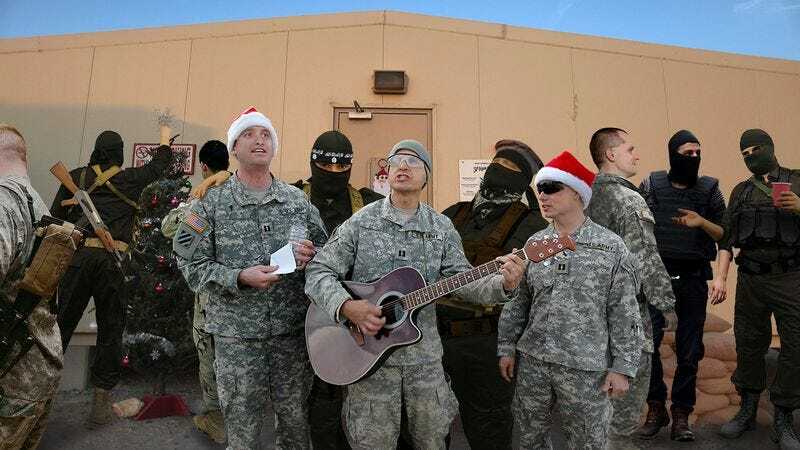 Last night, in the disputed Syrian city of Raqqa, the American troops and ISIS put aside their differences and came together to celebrate Christmas. The insurgents’ outpouring of Christmas joy was so stirring that, ignoring orders from the Pentagon and their commanding officers, American troops soon added their voices to the swelling chorus, abandoning their posts and mingling with their sometime enemies around a pine tree that one jihadist had cut down and adorned with makeshift Christmas decorations! It was the same scene all across ISIS-held territory in Syria and Iraq: Deep into the night and then into the morning, eyes shone with joyful tears as the fighters sang, fraternized, and even started games of pickup soccer with the very same young men and women who only hours before they would have publicly beheaded, hurled from a seven-story building, or shot with a sniper rifle from hundreds of yards away. If only for one day, the two sides were able to embrace, exchange modest gifts of food and cigarettes, and pray together in a solemn commemoration of the birth of Jesus Christ. Wow. It’s just more proof that even in the darkest corner of the world, even in a place where all hope seemed lost, even on the bleak battlefield of the interminable war in which these unfortunate people find themselves trapped—even there, it’s Christmastime. Merry Christmas to America. Merry Christmas to ISIS. And Merry Christmas to you and your family, no matter what side you’re on!